It’s funny—you would think that with a homeschool environment consisting of three people during most of the day, our family would have plenty of natural chances to practice solitude. My children are not wild or crazy or loud…but their personalities just do not lend themselves to the discipline of solitude, as described by Richard Foster. For one, solitude is supposed to be spent alone. And Luke, in particular, hates to be alone. We call him a “shy extrovert,” for, while he does not love crowds, he would like nothing more than to be surrounded by the people he loves, 100% of the time. He gets his energy from his loved ones, and wants to constantly interact with at least one other person from his inner circle, whether that is a family member or close friend. When Foster says, “the fear of being left alone petrifies people,” I think of Luke (96). And when he says, “Jesus calls us from loneliness to solitude,” and that “we can cultivate an inner solitude and silence that sets us free from loneliness and fear,” I see some of the value of solitude for my son. Anna, on the other hand, greatly values her alone time. However, Foster’s definition of solitude, as you can see in that last quote above, includes silence as a necessary ingredient. He elaborates, “It is quite possible to be a desert hermit and never experience solitude.” Anna would be that desert hermit. She can experience a vivacious, rich, inner world of constant chatter, emotions, and adventures, and not have a soul within miles of her. She can play happily in her room for hours, singing to herself, reading to her babies, and living in her imagination. But that is not solitude. And don’t get me wrong—I love that Luke wants to spend time with his family, and I love that Anna has such a rich imagination. But I also want to teach them to be alone—truly alone—with God. I want to teach them that they are more than their family, more than their imaginations, more than their need for entertainment, more than their emotions. Those are pretty abstract lessons that probably would go over the heads of my 9- and 10-year-old if I tried to spell them out. Thankfully, solitude is a simple, physical practice that can teach their bodies and their hearts ideas that their minds may not be ready for. April turned out to be a perfect month to practice solitude because the weather was amazing. Weeks ago, the kids asked Greg to hang his camping hammock so they could play in it, and he obliged, stringing it between two trees at the edge of our woods. The hammock has stayed up all through April and now May, and it has become a little sanctuary for us. When you lay in the hammock and look up at the lush, vibrant beauty of the forest, it feels like you are in your own private nature retreat. It feels luxurious. So that’s where we practice solitude. In the hammock. 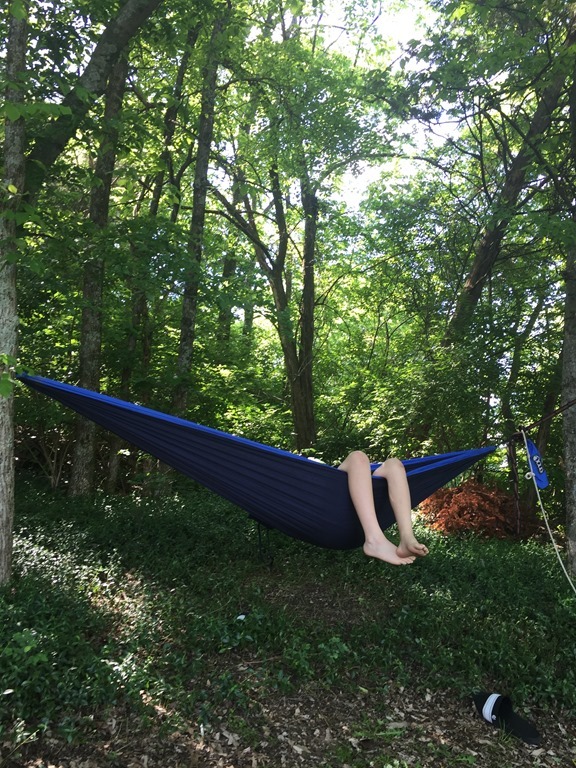 We even call it the “hammock of solitude,” and for ten minutes each day, I send a kid out there to “practice solitude.” I usually do it during our school day, so the child is only too happy to comply. And that’s part of my goal. I really don’t want “spiritual disciplines” to feel like a chore, but a gift. That’s how I see them. They aren’t “one more thing” we “have” to do to become holy. Rather, they are a present God gives us, a path to get to know Him better. And as knowing and loving God is our key purpose in life, anything that aids us in that goal is a blessing, not a burden. Through solitude, I want to teach my children to “be,” and to realize that in that “being,” God is with them. I want to teach them that contentment in being with God. In my own life, I see a continual temptation to strive and to find my worth—even my worth before God—in my actions alone. Solitude is a struggle for me because while I’m practicing solitude, I’m not “getting things done.” The idea of resting in God, in just spending a portion of my life enjoying His presence, does not naturally resonate with me. It’s something I have to work at. And so I want to introduce my children to that concept at an early age so that it will (hopefully) be more natural to them as they grow in their faith and understanding. What I love about the spiritual disciplines is that kids can benefit from them even without the understanding of all the abstract concepts that accompany them. In simply being still, alone in the hammock, they are embodying these truths at an age where they can’t yet fully appreciate them mentally. But through this practice, through the habit-forming and the discipline of their bodies, my prayer is that their soul is being nurtured and shaped to one day understand them. That’s not too say that my kids can’t grasp the basics. Anna knows that her mind is a chattering monkey that has a hard time being still. Luke knows that he hates to be alone, preferring the company of select loved ones for entertainment. Both of them see the value of solitude and stillness before God. But by introducing these ideas through simple bodily practices, these truths can be conveyed in ways that words can’t. And hopefully, as we continue to work solitude into our days, God uses that space to shape their souls and their hearts and to draw them closer to Him.